Improve the look of dry, ageing skin with Dr Dennis Gross Skincare C+Collagen Deep Cream, a luxurious moisturiser that works to hydrate, smoothen and brighten the complexion. 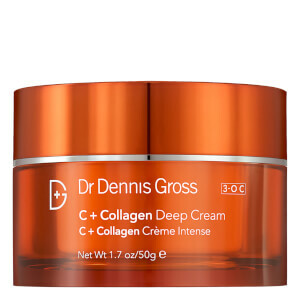 Promoting supple skin with a healthy, dewy glow, the cream combines the brand's proprietary 3-O C Vitamin C Technology with Collagen, Amino Acids and an Energy Complex to help enhance radiance and diminish the appearance of dark spots and wrinkles. Infused with a concentration of nourishing oils extracted from Camellia Japonica Seed, Sunflower Seed, and Rice Bran to provide skin with moisture and help reduce water loss. Delivering long-lasting hydration, the vitamin-packed formula will leave dry, ageing skin looking plumped, energised and bright. 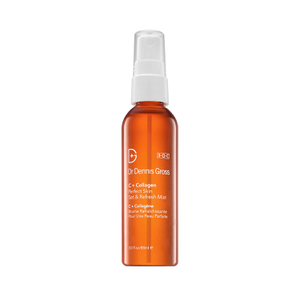 Smooth over clean, dry face, neck and décolleté. For AM/PM use. For best results, layer over a serum of your choice.